NEW OWNERS!!! YES!!!! New owners are working very hard to make improvements. Very friendly and helpful. Live on premises and are operating as their own managers. All washers and dryers are working. Fresh paint and clean! Bathrooms and showers are clean. Working on improving wireless internet. Gravel sites are level and well kept. Convenient location to walk to downtown Panguitch,local shops and restaurants. ATV friendly. Ride from park to trails. Stayed a month. We camped at Hitch-N-Post Campground in a Fifth Wheel. Not many campgrounds to choose from. Owners friendly. Gravel level pull through sites. Enough room for slides. Stayed here overnight. Would stay here again. We camped at Hitch-N-Post Campground in a Fifth Wheel. We enjoyed this park. It isn't fancy but it is comfortable. The new owners are welcoming. There are a couple of apartments on site with long term tenants. The tenants were very nice and helpful. The town of Panguitch is very charming and we were sorry we hadn't been able to stay longer and explore more. The only negative is that their pull through sites are very tight to get into for big rigs. The owner felt we could pull in without disconnecting our tow vehicle but we could see this would not work. It was a challenge to get just our forty foot coach in. The sites are wide enough but that access road is just too narrow. We camped at Hitch-N-Post Campground in a Motorhome. The park is a bit shabby from years of neglect but the new owners are doing a terrific job in cleaning it up and bringing it up to their standards. My only complaint is there was no cable TV. We were able to get a few SLC stations and the Wi-Fi was excellent. The owners are very friendly and will do what ever it takes to make you comfortable. We would definitely stay here again. We camped at Hitch-N-Post Campground in a Motorhome. Older but very clean and well kept park. Friendly (new) owners/managers working hard to make it / keep it attractive. Very handy to Bryce Canyon NP and Cedar Breaks NM. Easy access off main road through town (Hwy 89). Smooth gravel interior roads. Sites are gravel, level, small, close together. Hookups (50 amp, good water, sewer) well situated. A few trees, no grass to speak of. Good cell (AT&T) signal. Surprisingly quiet at night given proximity to Hwy 89. No security, no fences or gates (but owners/managers live above office). Rating would have been 7 if Wi-Fi were better; signal is stable but DOG-SLOW (I used www.speakeasy.net to objectively measure Internet speed); as fulltime RVers we need Internet. We would stay here again if Wi-Fi is improved. We camped at Hitch-N-Post Campground in a Motorhome. 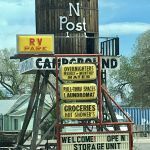 This RV park is centrally located between Cedar Breaks National Monument and Bryce Canyon National Park, and is a much less expensive alternative to another park at Bryce Canyon. The new owners are working hard to correct the problems that existed under the previous owners, and they have done a good job. The campground is neat and attractive. Interior roads and sites have a good layer of gravel, and sites are spacious and level. Many of the sites are pull-throughs. The bathhouse and laundry are clean and in good working order. Free Wi-Fi was available and my Verizon air card had a good strong signal. There is a car wash on site that costs $0.75 for 5 minutes. The rate includes a Good Sam discount and applicable taxes. We camped at Hitch-N-Post Campground in a Fifth Wheel. Friendly staff, greeted us upon arrival. Helpful with weather information and offered brochures of Bryce Canyon. Convenient to town, we could walk to several restaurants. New owners seem very enthusiastic about area and summer events. We camped at Hitch-N-Post Campground in a Fifth Wheel. It was okay for an overnight stop. Not much to do in Panguitch. Space was a little close to a tree limb but easy enough to get in and out. Would stay again - overnight. We camped at Hitch-N-Post Campground in a Fifth Wheel. We found this to be a very nice park although we only used our spot and none of the other facilities. We had a nice, flat pull through site with 50 amp service. We had no complaints and would stay here again. We camped at Hitch-N-Post Campground in a Motorhome. We stayed here on a trip from Tucson, Arizona to Salt Lake City in late March of 2010. It was the only facility operating early in the season, late March, as there was still snow on the ground and most of the other parks weren't able to fully open yet. The sites were gravel, level pull throughs. Management was friendly and helpful when checking in. When we travel this route again, we would stay here again. We camped at Hitch-N-Post Campground in a Motorhome. Only campground open this time of year, it was 14 degrees overnight and the water tap was frozen. Even with our propane and electric heat we barely made it thru the night. The other camper there made a much more dramatic flame sound when their heat came on, sounded like they were comfortable. In the AM we walked thru the snow to the showers and that made it all better. Nice and warm. It was nice that there was a place to go this time of year, and in the morning we were just a few miles from Bryce so we got there with the sun. Wish the water had worked, but it probably would have froze to the RV if we had hooked it up. We camped at Hitch-N-Post Campground in a Motorhome.